This season it seems everywhere I look, I see chocolate topped with sea salt, caramel made with fleur de sel, or salted candies of some kind. And it tastes so good; that combination of salt, sugar and chocolate! 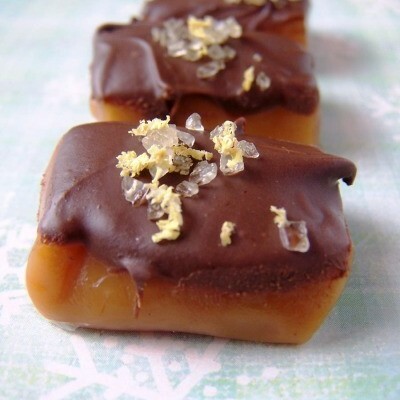 I looked through our holiday recipes, and found a really easy sea salt, chocolate and caramel version. It looked easy enough for a kid. So I enlisted the help of a very savvy 9 year-old in the kitchen. And I was right. My Little Assistant followed the directions, melted chocolate, dipped caramels and consulted on salt-chocolate flavor combinations. We ended up with 3 kinds: dark & mint chocolate with black lava sea salt, semi-sweet chocolate with Hawaiian clay sea salt and cinnamon, and semi-sweet chocolate with bamboo sea salt and lemon zest. They were all delicious, but the ones with lemon zest added a lovely citrus twang, and reminded me of summer. So they were my faves (shown above). MICROWAVE morsels and vegetable shortening in small, uncovered, microwave-safe bowl on HIGH (100%) power for 1 minute; STIR. The morsels may retain some of their original shape. If necessary, microwave at additional 10- to 15-second intervals, stirring just until morsels are melted; cool slightly. DIP caramel pieces, using a fork, into melted chocolate. Shake off or scrape excess chocolate against side of bowl. Place on prepared baking sheet. Sprinkle with sea salt. Refrigerate for 15 minutes or until set. * 25 square caramels can be substituted for the rectangular caramels. When December rolls around, I love to play holiday music, deck the halls of my little abode, and make some holiday treats. So, when I came across Jenny’s Holiday Baking video featuring this Very Merry Cookie Wreath, I wanted to try my hand at it. I followed the recipe in the video, but made a few changes. I wanted to make my own cookie dough, because I love chocolate mint morsels during the holidays, which are sometimes hard to find. So, I dug up this Nestlé recipe to create your own flavor-infused morsels – just use peppermint extract in place of raspberry. Then, I wanted to make my cookie wreath a little healthier (that way I can eat more holiday treats! ), so I used half the butter in the cookie dough and added 1 cup of chopped nuts. Finally, I wanted to use real butter in my icing, so instead of buying something premade, I used this recipe for cinnamon butter cream frosting (from one of our Libby’s Pumpkin Pie Deconstructed bloggers), halving the recipe and replacing the cinnamon with 1 tablespoon of peppermint extract. Putting the wreath together and decorating it was easy! I made my wreath with only 2 rows of cookies, only used half the icing to put it together and replaced the candy toppings with dried cranberries, shown above. Now, this was a minty festive holiday treat I could really feel good about. Watch the video above to see how to make Jenny’s Very Merry Cookie Wreath step-by-step. Also included in the video are step-by-step instructions for another holiday favorite: Gingerbread Cutout Cookies. If you’re like my family, you have mashed potatoes at every holiday meal. They are a classic. We like to keep the skins on, then mash them with garlic, cream cheese, milk and butter to make them creamy and tangy…and delicious. Chop the olives and cut the orange pieces in half, then combine the rest of the ingredients in a medium bowl and mix. Set aside. Mold leftover mashed potatoes into golf-sized balls. Pour enough cooking oil into a large skillet to cover bottom with thick film. Heat to very hot but not smoking, and drop potato balls in. Flatten immediately. Fry for 3 to 5 minutes or until golden brown; flip and brown other side, as shown above. Drain on paper towels. 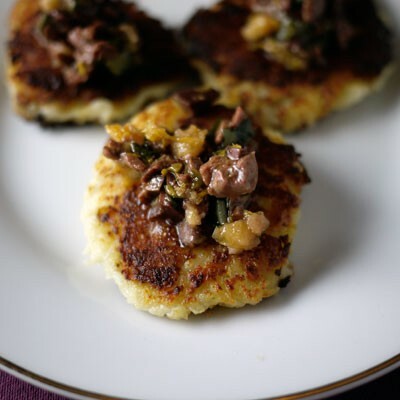 Serve with tapenade (photo above). Or, try the original recipe and serve with applesauce and sour cream.